After encountering some grammar questions this week, I signed up for the 7-day free trial of Grammarly. Grammarly, found at www. grammarly.com, claims to be not only an automated proofreader, but also a personalized grammar coach. I did my best to overlook the obvious grammar errors in the Grammarly dialog box and evaluate Grammarly on its own merits. You can use the free web tool without creating an account. Simply paste your sentence, paragraph or paper into a box, click on Check Your Text, and you will receive a score along with a list of errors and areas needing improvement. It is very easy to use. 8 grammar issues: pronoun agreement (2), confusing modifiers (3), passive voice use (3). 5 style and word choice issues: writing style (3), vocabulary use (2). I was apparently fine on spelling, commonly confused words, and unknown words. It also has a plagiarism checker, which I had not turned on. Without purchasing a subscription, this information is all you get. You get a score and a count of various issues, but no explanation. If you purchase the subscription (or sign up for the 7-day trial), you get explanations and examples. Based on the explanations in this week’s free trial, I made several improvements to my project. Some of Grammarly’s issues were merely suggestions about avoiding contractions, personal pronouns, and passive voice. In several cases, it unjustly accused me of squinting modifiers, incorrect subject/verb agreement, and misplaced commas. Even though Grammarly’s evaluation of some sentences was incorrect, I did learn some useful information. Do you know what a squinting modifier is? I didn’t either. Though disappointed in Grammarly's cost/benefit ratio for myself, I can see it being a useful tool for beginning writers struggling with the basics of grammar. It would probably be extremely valuable for international students who are puzzled, quite understandably, by the idiosyncrasies of the English language. If you have major grammar difficulties, I would encourage you to sign up for the trial version—you may find it more helpful than I did. After seeing the details provided by the subscription version, I don’t expect to regularly use the free version of Grammarly. Without the explanations, the scores and lists of issues are simply useless. In too many cases, Grammarly dings your score for things that are actually correct. Without knowing the specific sentence or clause setting off its alarms, you do not have enough information to evaluate whether or not there is a problem. In case you are interested, here are some of my questions, example sentences submitted for Grammarly-checking, and Grammarly’s diagnoses. So I pasted the following sentence into Grammarly. Grammarly suggests considering synonyms for rich, such as laughable, absurd, ridiculous, costly, or expensive. If an unwitting student followed this advice, the results would be laughable and the entire meaning of the sentence would be changed. Grammarly suggests changing was to were, because this is a conditional sentence. Apparently the suggested synonyms to rich are no longer applicable. Here are the most helpful resources I found. Grammarly was simply not capable of dealing with the subtleties of the subjunctive verb. I was confused about when to use her and when to use herself. This obviously did nothing to clear my confusion. I decided to omit the clause in question and just write, “Mrs. Grammer emphasizes the need for all writers to seek feedback.” While I’m fine with this result, I would still like to know whether her or herself should be used in that clause. Or are they both incorrect? Instead of changing the incorrect word insure to the correct word ensure, it suggests changing insure to the equally incorrect assure. If you are considering Grammarly, I hope you find this review helpful. I really wish this tool were a little cheaper. I would use it! 2 issues: wordiness and vague words (“really”). 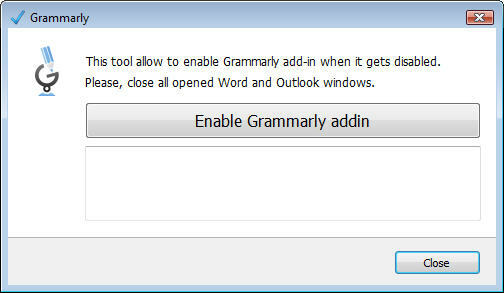 I just subscribed to the grammar-checking tool www.grammarly.com, and this box appeared when I installed the software. As I ponder the effects of the “write every day” model I have utilized (more or less) for the last nine months, I realize some definite positives, but also some real areas for concern. If I had not been writing every day, things would be much worse. I would still be very far from having a proposal ready to submit. My head would not contain nearly as coherent a set of ideas—ideas that somehow, through daily writing, have taken shape and arranged themselves. But too often, I find myself viewing my daily writing session as sort of a daily "bucket list" item, something that must be checked off so I can go to bed without guilt. Too often, I participate in a nearly worthless writing session, either because I am too tired to think straight, or because I didn’t get around to making a writing plan. I say “participate” to emphasize that I am accomplishing nothing worthwhile—I am like a student who comes to class just to get a participation grade. An ignorant onlooker might even think that I am one of those people who think I should get a grade, or a degree, or money, or something, just by participating, even if I didn’t learn anything or accomplish any objective. In reality, I don’t think this at all—I know that merely participating in an activity does not suffice to reap the rewards reserved for those reaching excellence. I am definitely not a member of the “everyone should get a trophy” camp. I don’t expect anyone to give me a degree for writing 30 minutes every day, even if I manage to do so for years. In fact, now that I’ve tackled this Ph.D. program, my other degrees seem like participation trophies by comparison. For my B.S. and my non-thesis M.S., all I had to do was take classes and check them off a list. When I checked off everything on my list, I got the trophy. The dissertation is not like this at all—I actually need to produce something of a certain quality level. My paper must be approved by a committee of experienced research professors, who are willing to stake their professional reputations on their assertion that I am capable of conducting independent research and writing for academic journals. In my math classes, I often encounter students who seem to think that just showing up every day is enough. Perhaps there are some who actually expect to pass simply because they came to class and paid attention, and will think it is unfair for them to fail the class, even if they fail all the tests. I think this is rare—most do not expect participation to trump knowledge. But some believe that participation produces knowledge--if they simply come every day, pay attention, and ask questions, they will automatically learn enough. In other words, they do not expect to receive a grade they did not earn, but they expect that mere participation will give them the required knowledge to earn that passing grade. Do I have similar expectations about my writing? Am I assuming that simply showing up to write every day will result in my learning how to do research and write a worthy paper? Do I expect that, merely because I slap my fingers against computer keys for at least 2.083% of each day’s minutes, knowledge and skill will travel by osmosis into my brain? My logic says no, but my actions say otherwise. It is so tempting to slide into a pattern of laziness, in which I pretend to be working hard but my brain is only half-engaged. Learning a difficult skill, whether writing, swimming, or anything else, requires a high level of mental effort. Am I willing to invest what is needed? Are you? If instead, I continue to settle for mediocrity, do you think my institution will eventually give me a participation degree? This is an oh-so-nifty tool for so-called writers who are having difficulty making themselves write. In case you are wondering about the odd title, it is explained here, in my first Snazzy Ware Selection of the Hebdomad, now quite a few hebdomads ago. As you may or may not know, my "writing streak", in which I wrote at least 30 consecutive minutes on my dissertation every single day, died back in December, at the ripe old age of 145 days. After it died, I went on an "avoid the dissertation altogether" streak of 16 days. Eventually I figured out this was not a good plan, and began to flirt again with the dissertation proposal, writing something at least every few days. While this was marginally more productive than avoiding it altogether, it caused me to not only lose momentum, but also to lose something less tangible, but perhaps more valuable. I realized that during the four and a half months I had spent visiting my dissertation every single day, Diss and I had actually developed a friendship, or at least a pleasant sense of companionship, a comfort in one another's company. Now, after being out of touch over the holidays, our friendship had cooled. There was no outright animosity, but our relationship had ceased to grow. I had forgotten some things about Diss that I should have remembered, and I think Diss had forgotten some important things about me. So, I have tried to get back into the habit of visiting Diss every day.This is only our 26th consecutive day being together again, but already I sense an improvement in our relationship. Unfortunately, tonight I simply wasn't in the mood to have a deep, serious conversation with Diss. But I didn't want to let our friendship lapse again, and I didn't want Diss to feel neglected. Most importantly, I wanted Diss to know that our relationship was sufficiently important that I wouldn't risk losing it by missing our daily talk. If a relationship dies, it doesn't usually die all at once--it fades away, and the fading begins when one of the parties lets it slip into unimportance, laid aside for supposedly more important things. So, since I didn't feel up to a serious conversation with Diss, but I knew we had to talk, I went to www.writeordie.com. Go to www.writeordie.com, click on Web App, and you'll see a little tool that will get you writing, whether you feel like it or not. For your goal, you can choose either a set time or a set number of words. Then you choose the punishment, gentle, medium, or kamikaze. You can choose the grace period, again either gentle, medium, or evil. These may not be exactly the correct adjectives. I cannot go back and verify them because I set the "Write or Die" app to kamikaze mode, with the evil grace period. I am not sure how long the evil grace period actually is, but supposedly if I pause in my writing too long, the kamikaze mode will start erasing my words. My screen is flashing rather weird shades of red and orange, which I think is my warning that the kamikaze bombers are coming. I think it begins flashing pink, then orange, and when it gets to red, you know you're in trouble. According to the documentation, if you pause too long in your writing, your computer will start to make evil noises. So far, my computer has been utterly silent. Perhaps my sound card is incompatible with Dr. Wicked's evil noises. But I do not doubt him...if I do not keep writing continuously, I will get erased! This entire blog post has been written on Dr. Wicked's Write or Die website, with the web app set on Kamikaze/Evil. I have decided that I am not allowed to edit this at all, except for whatever little bit of editing I can manage while still avoiding the kamikaze eraser. According to Dr. Wicked, the online web app will be free forever, but you can buy the desktop version for just $10. Check it out!! Please don't erase my words!! Please, please, please....I'm almost done!! !